The tree, placed on the grounds of Al Quds University, has come under fire for portraying jihadist “martyrs,” including terrorists involved in the recent wave of Palestinian violence against Israelis. This is in line with the Palestinian Authority’s continued glorification of such “martyrs”, which includes naming sports tournaments and roads after terrorists. The tree also displays a picture of Hamas founder Sheikh Ahmed Yassin. A photo of the tree has been making the rounds on Twitter. 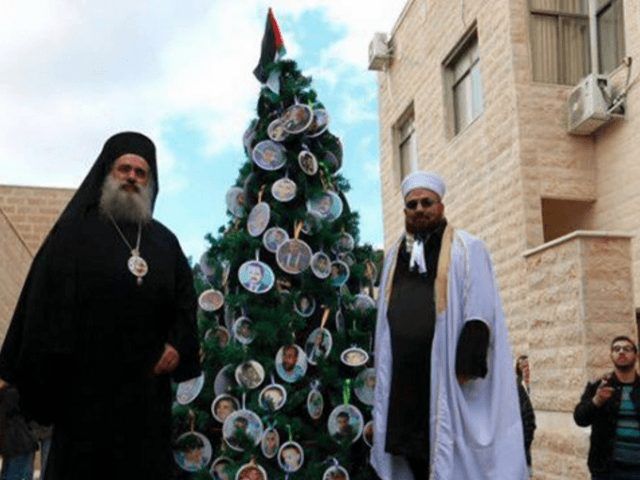 Pictured standing alongside the tree is Palestinian bishop Atallah Hanna. “Using Christmas to glorify Islamic terrorists is insane,” StandWithUs noted. Another photo has surfaced showing a tree in Bethlehem decorated with used canisters of tear gas.